Remember, that if you wish to get a Premium Membership to this website, you can do so by helping out scanning, editing, distributing or donating money or magazines. Depending on the age of the magazine you will be credited a Premium Membership as follows! Each video game magazine donated that is 1997-2001 counts as 2 weeks as a Premium member! Each video game magazine donated that is 1992-1996 counts as 1 month as a Premium member! Each video game magazine donated that is before 1992 counts as 2 months as a Premium member! Any help is appreciated in keeping this project alive! 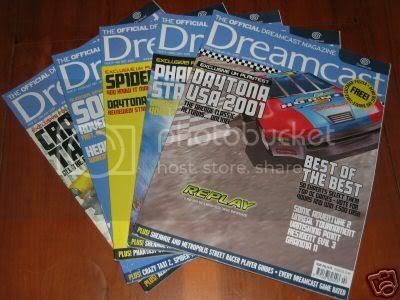 Official xbox magazine issues 13 through 24 with demo discs. Excellent condition. All 12 issues of 1997 Next Generation Video Game Magazine plus the January 1998 issue special limited edition. I have an extra october(1997) Issue with disc still in original plastic. All Magazines in good to mint condition. EXCELLENT LOT OF 4 VHS VIDEOS! YOU GET ALL 4 VIDEOS PICTURED! ALL ARE NEW AND UNOPENED! SEALED IN PLASTIC. EACH TAPE PROVIDES DETAILED HINTS, TIPS, AND CLUES TO HELP YOU MASTER NINTENDO GAMES! SHIPPING IS 4.00 IN THE USA. EMAIL ME FOR SHIPPING RATES OUTSIDE OF THE USA. THANKS AND GOOD LUCK!!!! PLEASE CHECK MY OTHER AUCTIONS FOR MORE NEW VIDEOS AND OTHER GREAT STUFF! I AM ALWAYS HAPPY TO SHIP ITEMS TOGETHER! WIN MORE AND SAVE ON SHIPPING! Well, I posted that I had won 12 UK Official Sega Saturn magazines last week. The shipping for 1 magazine is ?6.5, but the seller mentioned that he would combine shipping when you bought more than 1 item. So when I check out, I get over ?80 on shipping charges. Well, I have sent him 5 or 6 messages and emails about this, and he simply doesn't answer me. Not sure what the problem is but I noticed a couple of other people mentioned this in his feedback, although not that many. The thing is that I'm absolutely not going to pay ?80 for shipping a couple of magazines when I've got a parcel on the way with 2 Japanese Saturns, 1 Japanese Dreamcast, a PC-Engine arcade stick, a Neo-Geo AES original stick, a Saturn Virtua Stick, 4 GBA's and a whole bunch of Japanese retro games, all for ?55! Allright, a small update on the situation. Now the only problem is that my paypal account is acting up and refusing to send him the money, even though I know for sure that my Visa is perfectly fine. Up for auction are 12 back issues of Gamepro magazine from 1993. They cover all the classic game systems like NES, SNES, Genesis, Neo Geo, Gameboy and others! These are from my personal collection of retro game mags. They are in good to fair condition and most contain posters or other items. Look at the pictures below! A must have for the classic gaming enthusiast. Great to relive your childhood games and all the fun you had! I accept Paypal and money orders and buyer pays $10.00S+H. Please email me with any questions. Thanks for looking at my auction. Well, seems like I won't be getting those magazines after all. He doesn't reply to any of my messages, even though I paid for everything. I even sent a complaint to paypal, but he doesn't seem to be replying to that either. Thanks to Pulstar over at UG forwarding me the auction. Now lets hope this transaction goes as it's supposed to go. Looks like the paypal claim worked after all. Received my first batch of 12 Official Sega Saturn Magazines this morning. Couple that with the 15 that should be underway right now and the 3 that a friend of mine is going to ship me next month or so we're coming close to a complete collection. The only ones I'm missing are 8,9,24 and 35 so if any of you have these and would like to donate them. You're very welcome. I've been scanning the covers this afternoon, but some are in pretty bad shape, so they require major touchup work, especially the covers. But don't worry, the releases will start rolling out, hopefully starting again next week. In NM condition, this is a 3pack, at a value price. All three issues, including the great Joe Montana on the Winter 90-91' cover. I swear I couldnt sign in fast enough to eBay, That was a sweet deal for $8 shipped!!!!!!!! Holy hell! That's a lot of GamePro! 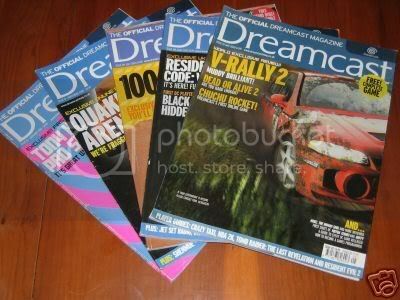 Just won 2 separate auctions for 5 issues each of the Official DreamCast Magazine from the UK. Not sure how many mags were released at the time, but what I do know is that Ed lomas from the glorydays of CVG and Official Sega Saturn Magazine and Alex Huhtala and Tom Guise from the best years of CVG worked on this magazine, among others. I only had a couple of issues in pretty bad condition, but if things keep going like they are, that will surely change in the next couple of months. Won Nintendo Fun Club Issue 2 for $36 with Shipping! Issue 24 has just arrived! It was a tricky one, as I had only seen this issue once before on sale.